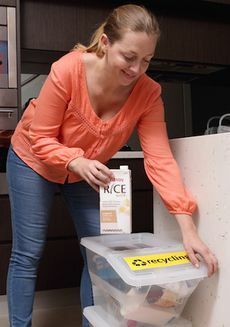 If your business produces something that is put into a bottle, tub, box or bag, we have a new tool that allows you to assess whether that packaging is recyclable in Australian kerbside systems. This tool, titled the Packaging Recyclability Evaluation Portal (PREP), will give you and your packaging designers peace of mind when making recycling claims. It might be surprising to learn that until Planet Ark launched PREP, there has been no way for designers to access clear, consistent and validated information about the recyclability of packaging. In fact, manufacturers often left it up to the consumer to make their own decision on whether an item was recyclable or they included just one of many recycling symbols on the product and hoped for the best. This places the business at risk of providing misleading information to consumers, which brings with it potential reputation and legal consequences. The PREP has been designed to give packaging designers nationally relevant, up-to-date and independent information on the recyclability (in kerbside systems) of the items they produce. PREP works by combining two important pieces of information to assess the recyclability of an item. First, it looks at the material's technical recyclability. That is, are recycling systems like material recovery facilities, set up to sort it? Once sorted, can it be processed? Secondly, it looks at accessibility to a kerbside collection for that material. What percentage of the Australian population live in a council area that explicitly collects that particular material? PREP is an online tool where designers enter the details of a new packaging item including the different materials, components and information about its use and disposal. The tool then generates a report, which deems the item as 'recyclable', 'recyclable with lost value' or 'not recyclable', along with information about why it received that rating. The PREP will be the foundation for a labeling and certification scheme, which will help reduce consumer confusion around what is and isn't recyclable. It's pretty impressive technology huh? These are exciting times for packaging and recycling so why not visit the PREP website and check it out. If you're business is a signatory to the Australian Packaging Covenant (APC) and you'd like to learn more about improving your approach to packaging assessment, you can join one of the upcoming forums in Sydney, Adelaide and Melbourne this month. Meet other signatories looking to improve and develop their own approaches. Planet Ark's CEO, Paul Klymenko, and Shaun Scallan will attend and present at each forum.